In April of 1993 Sergei Malykh and his young daughter, Olya, began to write to us. This online friendship has grown over the past five years and in late September 1997 we finally met Olya and her beautiful family face to face. In 1995 Sergei asked if we would do online courses with Olya to help her learn English. I agreed to teach her about Maryland along with some of my students at Delmar. We began a year long course all about Maryland. 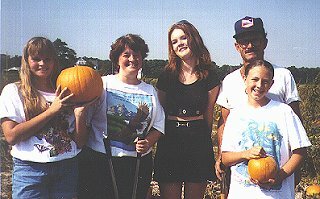 In the picture above Olya is standing in a pumpkin patch at the Delaware farm owned by Delmar student, Lisa Wright, and her family. Olya's dad, mother and brother have now moved to Michigan from Russia. On their way to Washington, DC the family drove to Delmar and visited some of the students who had been writing to her. 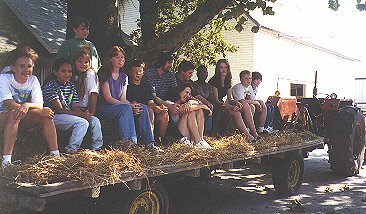 We took them for a hayride and along the ride we stopped to pick pumpkins. 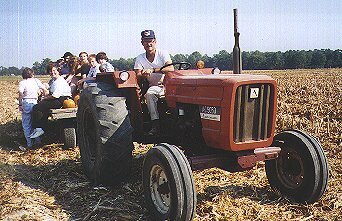 Lisa's dad drove the tractor that pulled us around the farm. 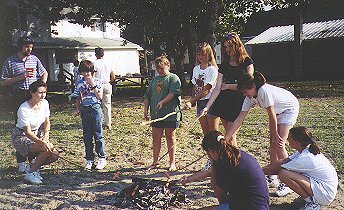 We roasted hot dogs in a campfire and made smores for our Russian friends to taste. Everyone will remember the good time we had meeting our friends from Russia.